Good luck trying to park it though. Last year, Dodge shocked the auto industry with the reveal of the unapologetically insane Challenger SRT Demon, a successor to the Hellcat with 840 hp on tap that’s essentially a road-going drag racer that can set ridiculously fast quarter mile times. 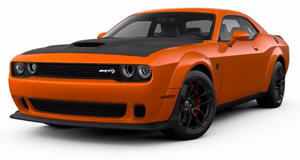 If you want your Hellcat to look as menacing as the Demon, Dodge is now selling the . You get the same 6.2-liter supercharged V8 with 707 hp as the standard car, but the Widebody borrows the Demon’s larger fender flares, which makes it 3.5 inches wider. Other cosmetic changes include the Demon’s front splitter, a new grille, and Air-Catcher headlamps. Crucially, the Hellcat Widebody features 20 x 11-inch "Devil’s Rim" split-five spoke aluminum wheels wrapped in 30 mm larger 305-section Pirelli P-Zero tires. These changes make the Hellcat a markedly better track beast than the standard car according to Dodge. Dodge claims that lap times are lowered by around two seconds on a 1.7-mile track, while quarter-mile times are reduced by 0.3 seconds. To find out if these claims are true, The Smoking Tire’s Matt Farah took the Hellcat Widebody for a spin at Buttonwillow Raceway. While setting laps around the circuit, Farah found the wider Challenger to be more stable at speed, more planted at the front, and less likely to step the tail out. This makes the car more predictable when approaching corners as power is applied more progressively than before, while the wider tires make a big difference to the turn in speed and grip. Prices for the Hellcat Widebody start at $71,495, a $1,700 tax and $1,095 destination fee.